Kip Macys says it was a 'bad decision' to saw through his tenant's floor. Kip Macy, 39, and his wife, Nicole Macy, also 39, were deemed "landlords of hell" by authorities for menacing the tenants of their San Francisco apartment building. In what authorities called a 17-month lawless rampage, the couple burglarized apartments, sabotaged the building's structure, and even sawed up through a horrified tenant's apartment floor, according to district attorney George Gascon. 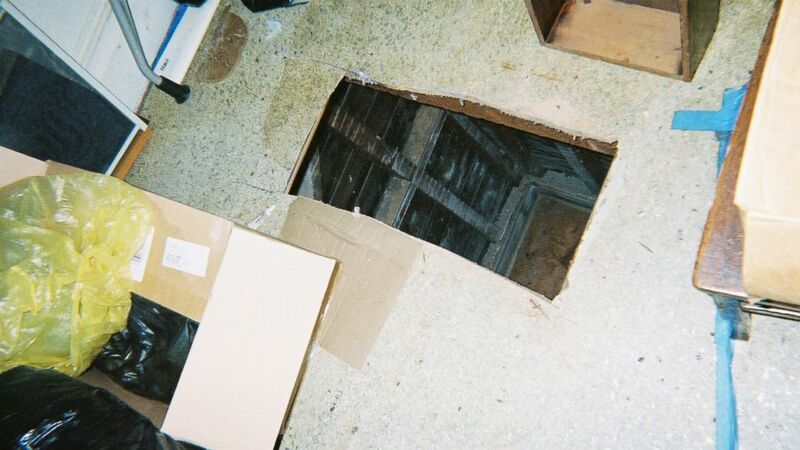 (San Francisco District Attorney) Hole cut through the floor of the Macys' tenant's apartment with a saw. "Well, they were trying to terrorize the tenants so they would leave," Gascon told ABC News' "20/20". "There was absolutely no other way to explain what they were doing." Kip Macy is serving a four-year sentence for two felony counts of residential burglary, one felony count of stalking and one felony count of attempted grand theft at the San Quentin State Prison in California. Summoned from a jail cell where he was awaiting transfer to San Quentin, Macy sat down for an exclusive interview with ABC News' "20/20," and said it all began with his wife Nicole Macy's idea. They were going to buy a four unit apartment building in an up-and-coming neighborhood of San Francisco, get the tenants to move out, and sell the individual apartments for a profit. "I was hesitant," said Kip Macy, who worked as a software consultant before buying the building. "But I mean, she assured me it wouldn't be that risky." Nicole Macy declined to speak to "20/20." From September 2005 to December 2007, Kip and Nicole Macy tried to make their tenants leave by any means necessary according to the DA, including asking a city inspector what beams to cut to make their building deemed unfit to live in -- and then actually doing it. 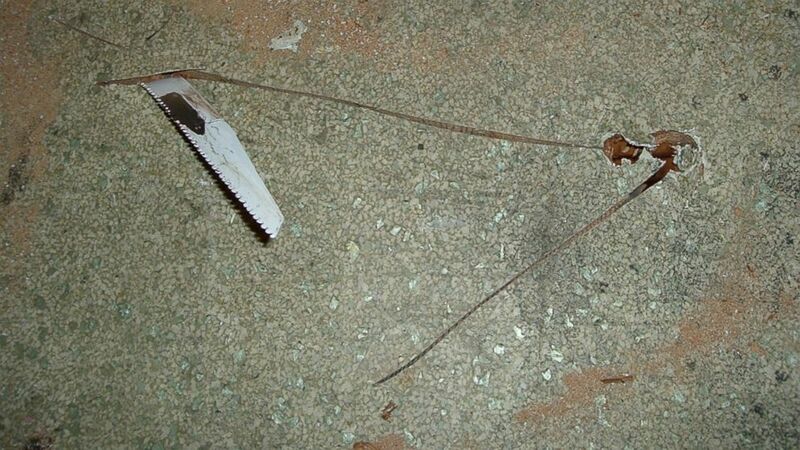 (San Francisco District Attorney) Photo of a saw stuck in the floor of a tenant's apartment owned by Kip and Nicole Macy. "They used a power saw and tried to compromise the structure of the building so the floor would actually collapse," DA Gascon said. The two also cut phone lines, shut off power, and boarded up the windows of occupied apartments. Kip and Nicole Macy even removed tenants' belongings from their apartments. "I regret, you know, having moved the Mexicans' stuff into the hallway," Kip Macy said. "I don't see how that was burglary, or theft, since I neither stole their stuff." He said he moved his building manager, Ricardo Cartagena's things because it was "garbage." "I mean, basically, if some homeless person leaves stuff in your garage and you [throw] it away, are you guilty of grand theft?" Kip Macy said. One tenant, Scott Morrow, stubbornly would not move out, which frustrated Kip and Nicole Macy. "Basically, Scott was sort of the ... one breaking point," Kip Macy said, claiming that Morrow made money off all the previous owners. "There wasn't actually any legal way of doing it right, since we had done everything right legally, and it hadn't worked," Kip Macy said. "That's when we started making bad decisions." Their "bad decisions" included cutting through the floorboards of Morrow's floor with a saw. 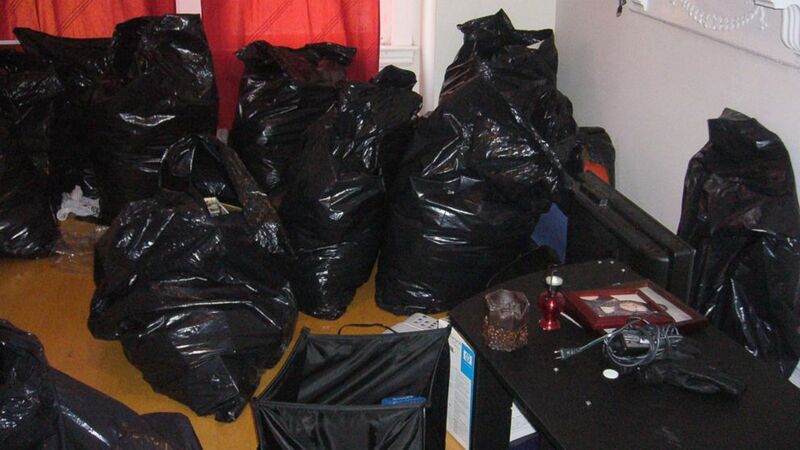 (San Francisco District Attorney) The belongings of several tenants were placed in these trash bags by their landlords, Kip and Nicole Macy, authorities said. "We harassed him a bit because [we] no longer had anything to lose," Kip Macy explained, saying he and Nicole Macy felt abandoned by the law. "He had parts of his floor cut out from underneath, also illegal, but whatever," Kip Macy said. Eventually he and Nicole Macy were arrested at Kip Macy's parents' house in 2008 and released on $500,000 bond, for which Kip Macy's parents drained much of their retirement savings to pay. His mother Marie even sold her jewelry to help finance their release. Once free, Kip and Nicole Macy jumped bail, fleeing to Italy, leaving Kip Macy's father and mother, potentially at a loss of half a million dollars. With the clock ticking before the bail forfeiture deadline, Marie reached out to bailbondsmen, Geri Ito-Campana and Ron Lee to find Kip and Nicole, and get her money back. Gumshoe work by Geri, with Marie as her wing woman, led them to Kip's bank, where someone had information about where Kip was getting paychecks. This led the sleuths to an address in Florence, Italy. After several days with no luck, Ron Lee was ready to give up, until an unusual sight in the Italian city, a Chinese restaurant, encouraged him to pull out his camera and take a picture. At that moment, in his lens view was Kip and Nicole walking down the street. Days later, after a meticulous plan devised by Geri and Ron, Marie stood in an apartment building lobby, face-to-face at last with her fugitive son. Kip and Nicole's Italian idyll was over. The district attorney had not sought extradition, so Geri took the pair to the U.S. Embassy. Ron shot photos of Kip and Nicole, with that day's newspapers, and an Italian cop ID'd them on an affidavit, all to ensure Marie could get her $500,000 back, as provided by law. "But then when it came ... to ask to have the bond exonerated, the district attorney agent said, 'well, we've changed our mind ... we've now decided to extradite,'" said Marie. The stunning switch required a different protocol for Geri to follow and the clock ran out. All appeals were denied. Marie says she followed the letter of the law to regain her bail money and for her troubles she was out half a million dollars. San Francisco district attorney George Gascon disagrees. "They fled the jurisdiction. They fled the nation and that's really what the bottom line is," he said. In June, Kip Macy and Nicole Macy plead guilty to four felony counts, each receiving sentences of four years and four months in prison.